Ticketebo is a powerful, simple to use online ticketing and event registration platform, delivering market leading ticketing services and event registration solutions to thousands of events across Australia each year. Ticketebo specialise in assisting event organisers across all event sectors (including festivals, sporting events, expos, conferences, schools and community events) professionally sell tickets to their events. 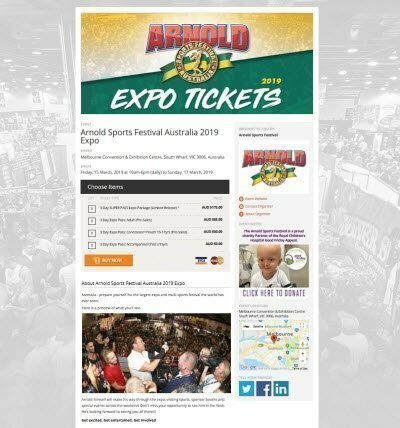 From small events through to some of Australia's largest and best known events, we deliver an extensive suite of online ticketing and on site ticketing services. Major Venues where Ticketebo tickets events include: Melbourne Convention & Exhibition Centre, Melbourne Showgrounds, Caulfield Racecourse, Melbourne Park Centre, Rosehill Gardens Racecourse, Sydney Olympic Park Athletics Centre, Sydney Quaycentre, Queensland Sports & Athletics Centre, Adelaide Showgrounds, Viking Park Stadium, AIS Arena, Knights Stadium, Darwin Amphitheatre, even the home of our very own Prime Minister, Kirribilli House, on multiple occasions! We invite you to check out some of the online ticketing pages our organisers have created...we think you'll agree they are stunning and effective. The flexibility of our online ticketing system enables organisers to create a ticketing platform for their event which complements their event's reputation and brand. A ticketing site professionally designed for optimal online ticket sales which mirrors the look and feel of your website! Free and easy to set up, and simple to customise for your event. As Ticketebo is all web based, there is no special software or modules to purchase. 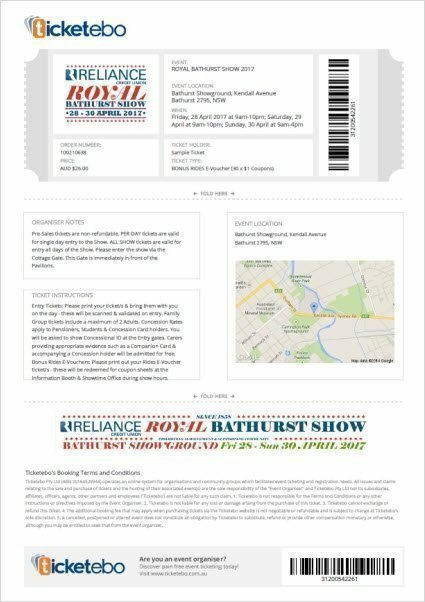 You don't have to pay for third party set-up or require any special training; even our entry management ticket scanning software (which is included for free for all events) runs on all standard smartphones. We take the headache out of online ticketing, allowing you more time to focus on organising your event. Of course, if you need any assistance, our customer service team is just a phone call away. Or you can chat live to us now using the live chat function at the bottom right hand side of your screen. Ticketebo is free for organisers! There are no set up costs, no registration costs, no monthly fees or expensive payment gateway costs. Instead the consumer pays a small booking fee, which covers all our bank processing costs and the running costs associated with our business. What about free events? They’re free on Ticketebo's ticketing system too, with no charges to organisers or consumers. For more about pricing visit our pricing page. 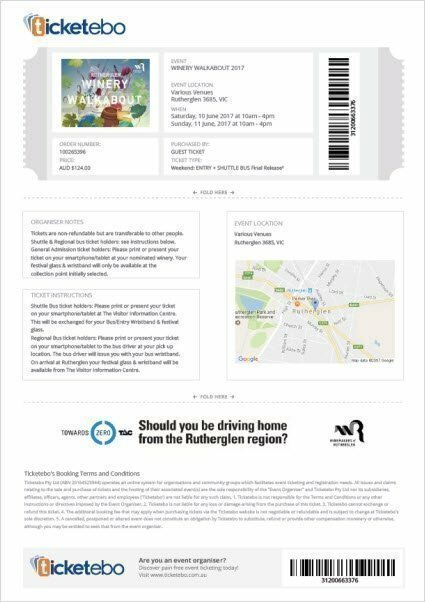 What can Ticketebo be used for? Whether you want to sell tickets online for 100 to 100,000 people for your next event – Ticketebo will work for you. In fact, Ticketebo can be used for pretty much anything where you need your customers to register their details to confirm their place. Ticketebo is used for festival ticketing, exhibition ticketing, conference registrations, online ticketing of school events, registrations for sporting events, club membership registrations, bookings for professional tour operators and theatre ticketing. Our Supporting Charities Program also ensures that charity and fundraising events are very popular on Ticketebo too. 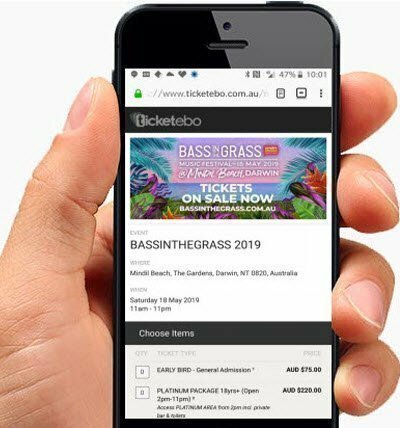 If you have specific needs for your next event – you can chat to us live online using the chat function (bottom right hand section of your screen), or alternatively drop us a note to sales@ticketebo.com.au or call us on 1800 381 939. So what do our event pages and tickets look like? What we love to hear most from organisers is how much they love their web pages on Ticketebo, and how great their tickets look. Our simple to use, professionally designed templates and online ticketing solutions ensure that everyone’s event page and tickets look stunning. And if you need a hand pulling it all together, we can help with that too. How do people buy their Tickets online at Ticketebo? We ensure the process of buying a ticket is really simple. By visiting the web address you created for your event (eg ticketebo.com.au/yourname), our simple 2 step checkout process ensures your customers select and buy their tickets quick and easily. They instantly receive their tickets or registration by email the moment they complete their purchase. Using Ticketebo is quick and easy, and we can usually have you selling tickets the same day. Register the details of your event here, where you will also choose your preferred web address for your event (eg ticketebo.com.au/yourname). Choose from the professional designed templates to customise your event. Or have us help build the event page for you. Check out our Frequently Asked Questions for Event Organisers, or chat to us live using the live online chat function on the bottom right hand side of the screen. Alternatively drop us a line at sales@ticketebo.com.au or call us on 1800 381 939. Want to read what Event Organisers say about Ticketebo? We hope the following independent reviews from other Event Organisers resonate well with you as they share their experiences about using our services.